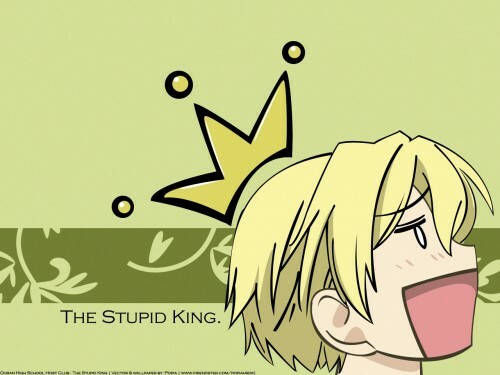 Ouran High School Host Club Wallpaper: The Stupid King. Minitokyo »	Ouran High School Host Club Wallpapers » Ouran High School Host Club Wallpaper: The Stupid King. Anyway, to those who have once commented on this wall in the Session Zero, you surely have seen a few versions of this wall.FYI, I have extended Tamaki's neck for the usual Taskbar as many have requested so. Despite of it's emptiness, I would like to remain the wall's simplicity.. (that's my taste and some's out there..) It seems wrong to add another flare into this wall, don't you think so? Hahahaha! I laughed so hard when I saw this. Awesome wall! haha it's beautiful. thanks for sharing.